Earlier in the day, Moldova’s Vladislav Ursu and Slovenia’s Aleksandra Vovk had secured a quarter-final place in the Mixed Team event at the Buenos Aires 2018 Youth Olympic Games by securing a doubles win by the very narrowest of margins. Later as the first round fixtures came to a close on the early afternoon of Sunday 13th October, Romania’s Cristian Pletea and Andreea Dragoman emulated their European counterparts, furthermore, likewise they upset the seeding. Vladislav Ursu and Aleksandra Vovk, the no.24 seeds, had beaten the combination formed by Chile’s Nicolas Burgos and Puerto Rico’s Adriana Diaz, the no.7 seeds. In a contest that followed the same pattern, Cristian Pletea and Andreea Dragoman, the no.9 seeds, overcame India’s Manav Vikash Thakkar and Archana Girish Kamath, the no.6 seeds. Archana Girish Kamath gave India the ideal start by reversing the result of the bronze medal Women’s Singles match of four days earlier. She beat Andreea Dragoman in five games (11-8, 7-11, 6-11, 11-9, 11-7). An opening defeat for Andreea Dragoman but from that moment forward it was success for Romania. Cristian Pletea overcame Manav Vikash Thakkar (10-12, 11-8, 11-9, 11-2), before a cliff hanging doubles success secured victory (11-7, 8-11, 4-11, 11-7, 12-10). Success in three matches for Romania, it was exactly the same for Chinese Taipei’s Lin Yun-Ju and Su Pei-Ling, the no.2 seeds, as it was for Russia’s Vladimir Sidorenko and Mariia Tailakova, the no.21 seeds. Facing DPR Korea, the no.32 seeds, Su Pei-Ling suffered at the hands of Pyon Song Gyong (11-3, 11-7, 11-6), before Lin Yun-Jun accounted for Kim Song Gun (11-8, 11-9, 11-6) and then partnered Su Pei-Ling to doubles success (11-9, 11-9, 11-6). Lin Yun-Ju the mainstay of success, for Russia against the Korea Republic, the no.30 seeds, that role was fulfilled by Mariia Tailakova. She beat Choi Haeeun (11-5, 11-9, 11-5), before Cho Daeseong accounted for Vladimir Sidorenko the level matters (13-11, 11-8, 11-7). Parity, Mariia Tailakova returned to the fray to partner Vladimir Sidorenko, a four games doubles win being posted (11-2, 5-11, 11-9, 11-7). 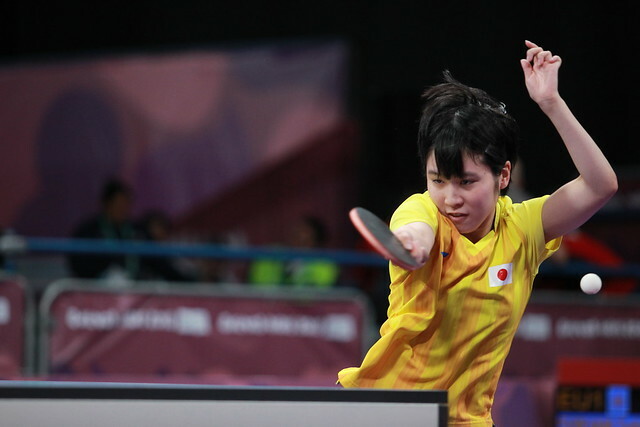 Full distance wins, in the one remaining fixture in the lower half of the draw no such alarm bells rang; China’s Wang Chuqin and Sun Yingsha, the no.4 seed, recorded a two matches to nil win in opposition to Brazil’s Guillermo Teodoro and Bruna Takahashi, the no.11 seeds. At the quarter-final stage Wang Chuqin and Sun Yingsha meet Vladimir Sidorenko and Mariia Tailakova; Lin Yun-Ju and Su Pei-Ling oppose Cristian Pletea and Andreea Dragoman.